A new car for under B. 100,000 is the promise from Tata industries in India; however, it will not be badged as a Jaguar, the marque that Tata has just bought from FoMoCo, but will apparently just be called a Tata. 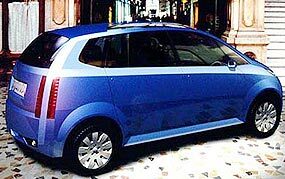 The concept of such a vehicle is a project pushed by the Tata chief Ratan Tata. The super-low price has been made possible by what is being referred to as “Gandhi” engineering. Forget luxuries and frills, but get back to the very basics of automotive transport. Who needs two windscreen wipers, when one is enough? Who needs electric windows, when handles are effective and cheaper? Who needs big powerful engines when the car is designed to only do 70 km/h, so a cheap $700 engine developing 35 HP is satisfactory? Even the wheel bearings are only capable of running up to that 70 kays speed, so are consequently cheaper. So the principle of Gandhi engineering is to jettison anything that doesn’t actually make the car go forward, stop and shelter occupants. Then with what is left, find ways to make the item even cheaper and lighter than anyone has done before. The steering column, for example, is a hollow tube and not a solid shaft. The lighter and cheaper concept also dictated a rear engine-rear wheel drive configuration, which is much cheaper to produce than a front engine-front wheel drive layout. This is simply because with rear engine-RWD, you do not need CV joints at the outer ends of the drive shafts to allow for steering angles. Gearboxes are precise and expensive items, so the Tata ‘Peoples Car’ uses CVT (Continuously Variable Transmission), which was the ‘rubber band and pulley’ transmission used by DAF many years ago. Again when you look at the top speed of this vehicle, the CVT will never wear out, and will also keep the engine running in the most optimal rev range and be therefore more economical. The new super-cheapie went on display in India in January this year and is mooted to be shown at the Geneva motor show in March, and hopefully might even be seen at our Bangkok International Motor Show in April. At the price, you wouldn’t bother insuring it, you just throw it away and get a new one. Is this the ultimate disposable commuter? Last week I asked when did pneumatic tyres first get used in a race? And who was the driver? The answer was very interesting historically. Pneumatic tyres were used in the very first official race, which was the Paris-Bordeaux-Paris event of 1895. The driver was Andre Michelin (yes, the forerunner of today’s Michelin tyres) who fitted his tyres on a Peugeot. Unfortunately he suffered numerous punctures and was disqualified for exceeding the 100 hours allotment for the race. However, the following year most cars were on Michelins for the race. So to this week. What was the first air-cooled racing engine, which had a large fan to force air across the cylinders? Hint: do not jump to the first conclusion! Australians bought 1 million new cars in 2007. Not bad from the population of 21 million. They also bought 1.4 million new bicycles in that time, outselling cars by 40 percent! However, it is wonderful what you can dream up once you have a few statistics behind you. The Cycling Promotion Fund (CPF), which is urging the Federal Government to invest in cycling infrastructure, say the figures show Australians have greater awareness of climate change and their health. “Australians want to become more active and are looking for practical ways to reduce their greenhouse gas emissions,” said CPF program director Rosemarie Speidel. Unless Australians have changed enormously since I left its golden sandy beaches, Aussies want something with a big engine to tow the boat to the aforesaid beaches, and with a big boot for the weekend shopping pilgrimage to the supermarket. Australia as a nation also has a problem with rampant obesity which continues unchecked, despite bicycle sales. No, Aussies buy bicycles because their child wants one, and a few adults think it is a good idea to be seen on one. After the first weekend of saddle sores, it sits in the back of the shed until it is given away to the local orphanage or to the kid next door. In actual fact, bikes have outsold cars for eight years, so it’s nothing new, but there are not more bikes visible on the road. Cars outnumber bikes by at least 1000 to 1 on the streets. Ideas of getting fit soon diminish, but since farting is an art form Down-under, the greenhouse gas called methane continues to be produced unabated. Statistics - I love ‘em! F1 to stop when it rains? For many years, the Indycar teams have not raced if the track was considered to be wet. I was present at the Indycar race in Australia a few years ago when it rained. We finished our race and then watched in amazement as their safety car with the American Clerk of the Course on board groaned around and around and around until eventually the rain stopped and the track was considered dry enough to race on. We considered them wimps. Now the overpaid EffWun wallahs have taken up the call. This year they have to do without Traction Control (TC), so they are going to have to be disciplined in opening the throttle in the wet, as electronics are not going to save them clobbering the wall. Pre-war Auto Union with twin bicycle tyres! 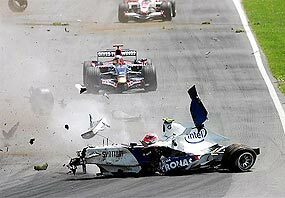 I’m afraid I don’t have much sympathy for Coulthard’s cause. The concept of motor racing is to drive as fast as you can, taking into consideration the condition of the course, the weather and the vehicle. I take my hat off to the drivers who can master the conditions. They are the best. I do not take my hat off to the drivers who want everything to be made ‘easy’ for them because they cannot master the conditions without an electronic ‘nanny’. If you can’t see, David, then slow down until you can. 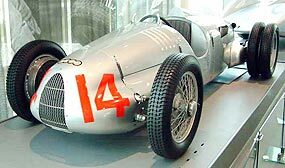 To Felipe I would say that perhaps he should look at history, when the Mercedes and Auto Union teams were racing before WWII in 600 horsepower monsters getting the power down through something akin to bicycle tyres, without any electronics. And they didn’t stop for rain. For once I find myself agreeing with FIA head honcho Max Moseley who does not believe that the absence of TC will compromise safety. Mosley believes that speeds will be lower without TC, which means less chance of injury. Which gets us back to racing within the conditions. If it is more slippery, then you drive slower! If you can’t see what you’re doing then you slow down until you can. Do we have to tell the so-called “best drivers in the world” this very obvious fact of racing life? The numbers assigned to the drivers (other than the number 1 plate which goes to the previous year’s champion) relate to the position of the team in the manufacturer’s championship in 2007, which explains why McLaren have been given 22 and 23, having been disqualified in 2007 and therefore “last”. The pit garages are also assigned by the team numbers, hence Ferrari will be at the first pit garage, whilst McLaren will be at the last.